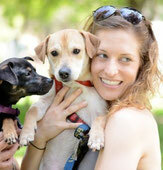 Lacey is one of DOGzHAUS' volunteers who has fostered several dogs for DOGzHAUS and is our foster mentor. We care about our fosters as much as we care about the rescued dogs providing personal attention to show we appreciate and want our fosters to be happy about fostering our rescued dogs. Being a foster mentor, Lacey regularly contacts fosters to make sure everything is going well with their foster dog and offers advice if needed. Fostering an animal can be one of the most rewarding things you do. The dogs and cats that DOGzHAUS rescue come from local animal shelters. After a stressful life in the shelter (and for various other reasons) dogs are typically scared and sometimes shy. Many of these animals have never been given any love, training, or medical treatment until they are brought into the shelter and/or our foster program. DOGzHAUS provides all medical treatment a foster dog may need. If you are interested in fostering a rescued dog, please click the application below, fill it out and return it to us. We will contact you shortly after receiving the application. If you are still wondering what fostering is, please click here "Fostering: What's it All About" for more details. Will the gate be locked with a padlock? Do you have a pool or a spa? Besides your immediate family, are there other residing in your home? If no. Where will the dog stay while you are gone? Where will the dog be kept most of the time? If kept outside, will you have a dog run and or dog house? Would you let the dog outside by itself occasionally if you had a house with lots of land and away from busy streets? If Yes, Please specify type ( dog ,cat, etc...) and age current on vaccines? If Yes, What was the circumstance? If you have owned other dogs and do not now, what happened to them? Are you inersted in learning other training or discipline methods? What size of dog(s) are you interested in fostering? Reason? Thank you for interest in fostering a rescued animal. The information you will provide on this application will help us make the best possible match between each rescued animal and a prospective foster home. Please be sure to answer all questions as completely as possible. Omitted information may require follow-up contact by a DOGzHAUS volunteer. After you filled out the foster application and are approved as our foster, you will need to agree with our foster agreement. Please click the PDF icon and read the agreement. If you can't agree with it, please do not submit the foster application.